Rain forecast, but sunny, dry, hot and windy. I went out to cut off some dead bits from the flower pots outside the front door, but within 15 min I had a near-fatal pollen attack and came in feeling a tad defeated. I do like a beautiful garden, though you would never have guessed, I know. I really want to go to one or two mixed media workshop/s in NSW, Australia, and stayed up intil 3AM (insomnia,) looking up website to try to figure out the overall cost to see if I can justify it, and/or talk Ben into a holiday in Oz while I take workshops some of the time. (He hates that config.) This is surprisingly close to Kaz's town, in the context of that vast, Australian scale. Not a sin to hope I can wing it. Pat came over with two of my new books on van Gogh and two of Ben's on photography; we ordered these in Sept and had them delivered to an US address and Pat was going to bring them back, but her trip was cancelled and she had them posted. I showed her my troubled red warp and explained my eight-step recovery plan, and another plan I decided against, and told her I haven't done it because I like the piece in progress. Subconsciously I've still been considering other warp tension recovery options as it turned out. (Spray starch being one.) Pat agreed that if I could, I should complete this piece; it is an interesting one. By the way, the new two-colored warp; I really liked it when I was making it upstairs but since I came out of the shower and saw it on the weekend I can only think of scallops. So not sure now. It's Monday, so the third day Mom's in her new apartment, and she's loving it; it's much warmer than our 40+ year old house, and surprisingly far more quiet even though it's in a semi-urban setting. To go grocery shopping, a small mall, or the train station, she only needs to take the elevator and walk perhaps three minutes. (For her to go shopping around Yokohama Station, she'll be exposed to outside air only around the two train platforms, her new station and Yokohama, so, like, even in the middle of the winter, I don't think I'll even need a real coat!) It's a ten-min walk to Brother's house, and Sister is a 20-min drive away. And so many folks are helping her she's actually very pleased with the constant company. From what she told me she culled kitchen- and general household-related things, (and she needs much less now that she's in an building,) but left nothing relating to weaving and spinning behind. The big tidy up last Feb/Mar helped, I might add; there wasn't much she would not have wanted to keep, except perhaps old rug yarns, but she even took those. Sister was dismayed at the sheer amount, but we weavers know it's just a different point of view. No pictures from anyone yet; we tried Skyping on Saturday but Sister's smartphone couldn't show pictures for some reason. 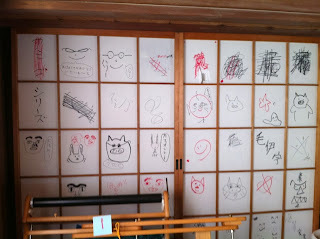 So I'll show you probably-her-last pic from the old house; kids drew on and ripped the shoji paper screens upstairs on New Years' Day. That's in the room I lived in for months opening and closing them very carefully so as not to damage the paper. Grandkids have all the fun! In front is one of the looms, numbered and coded by Sister. Ooops, Ben just came home with a bunged up, torn package from Better World books; yay, four more van Gogh books mostly ex-library, and now my very own copy of "basic design"; I couldn't for the life of me find this used or new in 2009/2010, but now they are all over. Recommend! But goodness, these books have had a rough trip this time; but I can't complain, as they send for free. EDIT: You know I don't teach weaving. Well, a young friend emailed me to let me know she bought an RH in Christchurch for $30 and brought it back on the bus and can I teach her how to use it. How can I say no, right? She's coming on Friday and we'll go from there. I'm a 30% nervous, 50% excited, and 20% "must prepare" mode. yikes? Ordered myself a copy of 'basic design' on your recommendation. It's, also, coming from the US so may take a few weeks :) I love book recommendations, so Thanks! So glad to hear your mom is loving her new place. Sometimes we think older folks can't change, and then life happens and they do, just like that. Oh, no, you didn't, Blogger. How dare you loose my comment two days in a row, and this was a long one! Jane, it is a good one, I think, in a humorous, American way. Not funny-ha-ha, but the three co-authers, from memory, were practicing artists in different fields, not just teachers, and they express their disagreement, too. The exercises are not easy nor quick, but enjoyable, and there are plenty of photos and illustrations, without which I don't last 15 minutes with this type of book. There will be methods/techniques that speak to you, I hope, which you may continue to use many times, as well as others nice to try once and move on. I think it's worth taking the time to work on the exercises, rather than work through them quickly just ti say you've done them. I caught myself thinking subconsciously and unconsciously while working. Connie, well, yeah, everything is working out so well for her. I can only dream of living in a nice big clean apartment with all my weaving stuff like her. With Ben. But the old family house was never as bad as the rest of the family claim; it had guts and character and wasn't for softies, if you can tame it, it was a rewarding house to live in. I even considered going back there for the month of Feb to live there alone but it'll be too costly to maintain it just for myself, so I'll stay here. One thing to note is this book was written in the 80's, so not much about the Internet. Another I discovered were the exercises requiring light fluids to lift ink off printed pages; technology has changed and print material now uses vegetable-based oils (?) so the fluid doesn't work but you need something from the kitchen, I think, but I can't remember what it is. You could google or check out multimedia art sites now, though, couldn't you! I'll be the one to say it. That warp doesn't remind me at all of scallops. It's gorgeous! It will create lovely pieces, no doubt, and I have selected a few wefts to sample... But but but it does have the inside-of-scallops colors... if you eat as much scallops as I do, (and I try to in Japan,) ummm.... Margery..... Oh, now here's an idea; how about wasabi green? ?